There are many 2.4 GHz “magic” remote, often called Air mice, to use with Android devices, or computer mainly such as Mele F10, or Measy RC11. 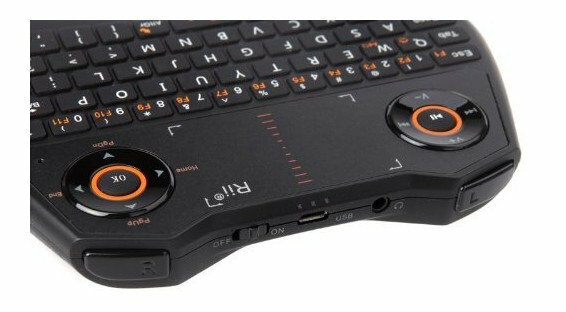 They usually comes with a qwerty keyboard, and a gyro that allow you to move the mouse pointer on the screen by moving the remote around, and are much more convenient that a standard IR remote with Android mini PCs. 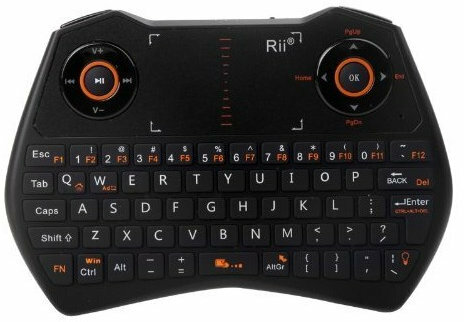 Newer models such as Mele F10 Pro often include a microphone, and a jack to connect an headphone, but Rii Mini i28 is going a few steps further, some may even say a few steps too far, as it features a backlit QWERTY keyboard, Air mouse function, a microphone and a headphone jack, as well as a touchpad, and some of controls that make it look like a gamepad (No analog though). 10 buttons for arrow keys, vol -/-, trick modes, page up and down, and OK. The remote comes with the USB receiver to connect to your device or computer, a USB cable, and a user’s manual. Contrary to the Mele F10 Pro, they still managed to keep a tiny USB receiver, despite the added audio functions. The device is said to work with Windows 2000/XP/Vista/8, Linux based distributions, and Android, as long as a USB port is available. I initially found Rii Mini i28 via W2COMP where it goes for $49.99, but it’s also available on Newegg or Amazon, as well as Aliexpress for $46 and up. You can also some information on Riitek’s page. 1$ and you can get droidmote on your phone that is better and more usable. You can use all multitouch apps and games on your tv. For windows and Linux is free. Nice. The other advantage is that it’s based on Bluetooth, so no need to connect an extra dongle. The downside with Bluetooth is that it needs to be paired first. So you’d have connect a mouse and/or keyboard first for the first time setup. Not sure it supports “Air mouse” function however. @cnxsoft Ah, no airmouse would ruin it….